The fine folks at Movies Unlimited, and their official movie blog Movie Fanfare, very kindly asked me to contribute a guest blog article for them, one I’m proud to re-post here on SBBN. Duel at Diablo (1966) is an odd, unique Western, a rare collage of individual desires in a genre that routinely celebrates the successes of teamwork, partnership and camaraderie. One of the most talked-about aspects of “Duel at Diablo” is the music which, at first, seems wildly out of place, far too cheerful and lighthearted for the subject matter. 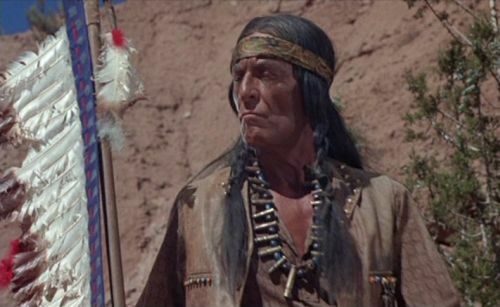 But listen closely to Neal Hefti’s score: The theme for the Apache is a strummy guitar track laid over a driving beat that mimics stereotypical “Indian drums”. Underneath the jazzy main theme track is a sweeping, orchestral score that would be right at home during a majestic scenery shot in any VistaVision Western of a decade earlier. 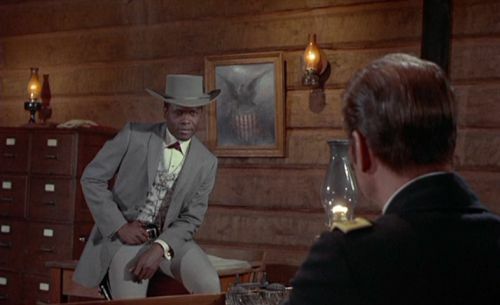 The music is as anachronistic as the background of the character of Toller (Sidney Poitier), a civilian businessman who once served as a cavalryman in the same regiment as Scotty McAlister. During the so-called “Indian Wars”, black soldiers such as Toller were segregated into all-black U.S. Cavalry regiments known as Buffalo Soldiers. While historically it’s possible Toller would have served at or near Fort Concho during the Apache Wars of the 1870s when “Duel at Diablo” takes place, he would not have served in a unit with white soldiers. Yet this anachronism is not problematic in the least, as Nelson has unabashedly made a 1960s Western movie. This is not a historical piece, a documentary, an apologetic retcon for the problems of American Westerns of earlier decades. Rather, Nelson quite purposefully embraces the culture of the 1960s while telling a story set in the 1870s. That’s why the beautiful tailored clothes of the businessmen are not in period-authentic fabric. It’s why the cast isn’t all white male Americans, and it’s why the Apache’s theme music as they travel back to their rightful land is a peppy guitar number that makes you think The Monkees are about to run on screen in wild abandon and jump off a nearby bridge. Each generation reinterprets the stories of previous generations. Some try to change the past — “The Searchers” in many ways is the apologetic version of “The Big Trail” — and some add to what has been told before. 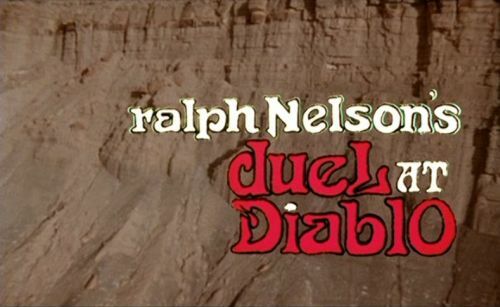 And that’s the essence of what director Ralph Nelson does with “Duel at Diablo.” He does not attempt to change the Western, he preserves it, augments it, and the result is glorious. The cast in “Duel” is strong, of course, with some of the best actors of the generation in featured roles. Poitier gives an effective, effortless performance, as does Bibi Andersson. Bill Travers was a Shakespearean stage actor and it shows. Watch for his line reading when quoting “Scots Wae Hae” while on horseback and tell me he is not channeling Shakespeare’s Richard III. Of all the terrific performances, James Garner’s stands out. Garner in the 1960s was fighting an undeserved reputation as being just a television star without the necessary dramatic range for film. 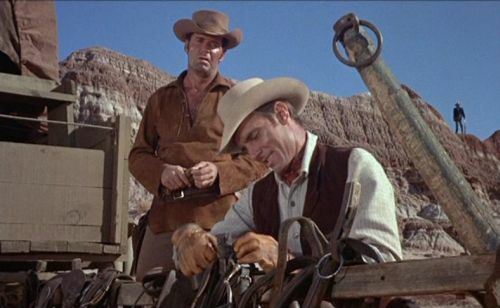 By 1966 and “Duel at Diablo”, Garner had avoided the Western genre for several years, deliberately distancing himself from the television show that made him a household name. Surprisingly, his return to the Western in “Duel” removed him even further from the Bret Maverick stereotype. Jess Remsberg is tough, he is not afraid of guns, his emotions are raw and frayed. Garner’s portrayal of a troubled man on the verge of becoming unhinged is at turns subtle and powerful. His every movement, every expression means a million things at once. Note in particular the flash of anger that contorts his face for a sliver of a second in Clay Dean’s office. The title of the book this movie was based on, Apache Rising, may initially appear to be a better fit than the title ultimately used. Yet confrontation is the enzyme of this film, the method by which the plot moves forward. We are literally taken through a series of duels by the characters: Jess versus Toller, McAllister versus Grange, Toller versus McAllister, and so on. Each character has their own specific motivations that are revealed in measured manner as the film unfolds. Most Westerns utilize the convention of the lone cowboy who ultimately pairs up with a good friend, an ally, sometimes an old enemy. In “Duel”, no one bands together to fight a common enemy. Scouts go out alone, Toller takes over the cavalry without help from a wounded Scotty, and cavalrymen eschew the wisdom of safety in numbers. As the group fights to survive the attack from the Apache, people are picked off individually, and when a soldier is felled by an arrow, no buddy is there to drag him back to safety or kill an Apache in revenge. The movie holds an anti-war metaphor, too, portraying a series of small conflicts that ultimately lead everyone to the devil: Diablo. Some survive the final battle in Diablo canyon; many do not. The surviving Apache are taken back to their reservation, and Jess asks why they should stay there. The Apache weren’t ignorant savages killing without good reason, he says, and he is right: The only scalp we see in the film is the result of a white man killing a Comanche woman in pointless revenge; this white man later used the scalp for a bet in a cheap poker game. The same hollow feeling of the survivors as they make their way out of the canyon is shared by the audience as the movie ends. Welcome to the MovieFanFare fraternity/sorority! I was so excited when I saw your name as the guest blogger this morning. Great write-up! Wonderful article and thank you for the kind words and links t=at the top of the page. We will do what we can to bring readers to the article. Great review – I enjoyed reading it a lot and will look out for the movie. It sounds like an interesting and different Western. Hi all – my apologies for not replying sooner. Buffalo Solder, your novel sounds terrific. I’m a huge history buff, and I live near Ft Riley which has some significant Buffalo Soldier history. Good luck with the movie! Thanks for the kind words, Edward and Judy. I think you’ll like the movie, Judy, it’s a good one!